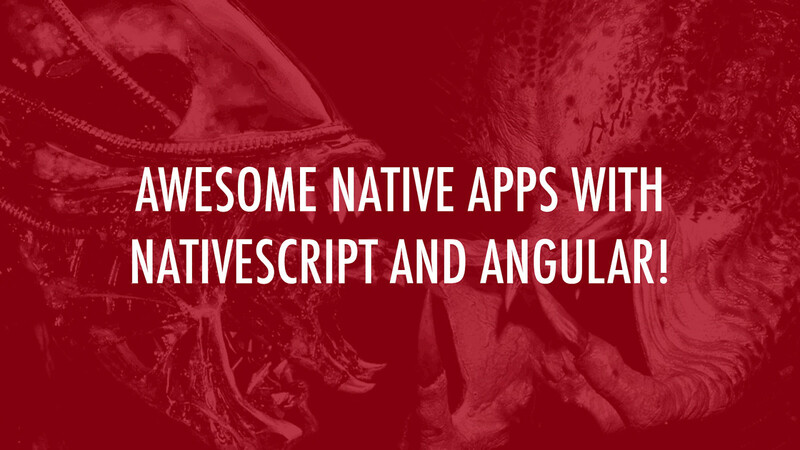 @ROWDYRABOUW AWESOME NATIVE APPS WITH NATIVESCRIPT AND ANGULAR! @powershell -NoProfile -ExecutionPolicy Bypass -Command "iex ((new-object net.webclient).DownloadString('https:// www.nativescript.org/setup/win'))"
"Hello Ł ÓD Ź "
"TAGLINE" : "Whoever wins... we win!" "HEADER_CUSTOM" : "Custom iOS Slider"
< Label [ text ]= "'HOME.TAGLINE' | translate"
View Awesome native apps with NativeScript and Angular! on Notist. Developing native iOS and Android apps can be very time consuming and expensive. What if you could build native apps with one code base and web techniques? Well, you can with NativeScript! In this introduction, I’ll explain what NativeScript is and how it compares to other platforms. And in a live demo, I will show you how easy it is to get started and to make use of native capabilities.